There was a time when England was known as 'Mary's Dowry' and 'The Island of Mary'. Indeed by the eleventh century England was the only land of Western Europe where devotion to the Mother of God was so widespread and it is here that the Feast of the Dormition was first introduced from Constantinople (1). By the eleventh century there seemed to be shrines to the Mother of God everywhere (2). Thus we know of shrines dedicated to Her at Glastonbury in 540, Evesham in 702 (3), Tewkesbury in 715, Canterbury in 866, Willesden in 939 (4), Abingdon before 955, Ely in 1020, Coventry in 1043, York in 1050, Walsingham in 1061. Without doubt there were many other shrines and holy images. Of some we know nothing, of others we know that they must have existed but we hear of them only later in the twelfth and thirteenth centuries. For after the eleventh-century Great Schism, when most of Western Europe fell under Papal sway, devotion to the Mother of God continued. Admittedly, this devotion began to take on the pietistic forms of the Middle Ages and images were replaced by statues, unheard of in the Orthodox world, East and West. Some of these statues were given specific names either of places or else of particular virtues, for example: Our Lady of the Garden Gate (Somers Town, London), Our Lady of the Crag (Knaresborough), Our Lady, Mother of Mercy (York), Our Lady of Grace (Ipswich). This practice still mirrored the practice of the Orthodox Churches, in particular of the Russian Church, where over 600 different Images of the Mother of God were venerated before the Revolution and Russia was known as 'The House of the Mother of God'. Our interest, however, is centred on Our Lady of Grace, the Ipswich Mother of God. Suffolk in the early Middle Ages was renowned for its piety. Indeed when the Danes invaded in the ninth century, martyring St Edmund, they found so many churches and chapels that they called it 'Selig Suffolk', meaning 'Blessed' or 'Holy Suffolk', which by corruption has today become 'Silly Suffolk'. Indeed we know of no fewer than sixteen shrines to the Mother of God in Suffolk. These were: Beccles, Chevington, Eye, Ipswich, Ixworth, Melford, Mildenhall, Mutford, Norton, Stoke-by-Clare, Stowmarket, Sudbury, Thetford, Weston, Woodbridge and Woolpit. There may have been even more, but of them we have no record. However, by the end of the twelfth century, although the major national shrine was at Walsingham in Norfolk, second only to this was the Shrine of 'Our Lady of Grace' in Ipswich. Within the last generation archæologists have confirmed that Ipswich is the oldest of all English towns, founded in the sixth century, when our forebears arrived across the North Sea from northern Germany and southern Denmark. Minor settlements and small hamlets on the south and east coasts there were indeed before Ipswich, but Ipswich was without doubt the first English town. With its port and market, industries and trades, it became famous especially for its pottery, known to historians as 'Ipswich-ware'. Later surrounded by earthen ramparts built against the Danes, it became in the early Middle Ages a walled town with four gates with thirty-nine Pre-Reformation churches and monasteries. The main gate in the walls was the West Gate and leading up to it, still today, one may find 'Lady Lane', where once stood the long ago demolished 'Chapel of Our Lady of Ipswich'. It was here that the local population venerated from at least 1152, if not earlier, a statue of the Mother of God. Certainly in 1297, this chapel was recorded as 'a religious house of note at an early period of our history'. All surviving records witness to the fame of the Image of the Mother of God and the many marvels and healings of grace worked by it: 'The Image of the Blessed Virgin, known as 'Our Lady of Ipswich' was held in high regard, to which many pilgrimages were wont to be made'. 'The celebrated image of the Virgin there made the name of Ipswich famous in ancient days on account of the miraculous powers of the curing of diseases which this venerated image was reputed to possess'. Records survive describing the image, even giving particulars of its colours ('blue and deep rose') and the pleats in the robes of the Virgin. There were several royal pilgrims. King Edward I's daughter, Elizabeth, was actually married in the shrine chapel, Blanche, daughter of Henry IV, came on pilgrimage and there are full details of the pilgrimage of Catherine of Aragon and Henry VIII. It has also been suggested that Chaucer's The Canterbury Tales was inspired by pilgrimages to the shrine, since 'The Father of English Poetry', it is claimed, was the son of an Ipswich vintner. We also know that the notorious Machiavellian Cardinal Wolsey, an Ipswich man, established a procession to the shrine on the 7 September, the eve of the Feast of the Birth of Our Lady. And in recent times the local 'Guild of Our Lady of Ipswich' has instituted an annual pilgrimage walk reviving that procession on the nearest Sunday to 7 September. All of this may seem to the reader to be only of passing historical interest and no more than this. However, the Ipswich Mother of God has a special interest for English Christians today. Unlike all the other shrines of England, it is widely believed that 'Our Lady of Grace' survived the 'Reformation' and still exists. At the Reformation, in July 1538, the statue was removed from its Ipswich chapel and sent off by ship from the port of Ipswich to be burnt together with other statues and relics in London. Here, in September 1538, Thomas Cromwell, charged by Henry VIII with destroying 'Papist idols', lit a huge bonfire in which many objects of piety were burnt, including the statues of Our Lady of Walsingham and of Willesden. There is a mass of tradition and documentary evidence to suggest, however, that, despite the evil intentions of the iconoclasts, 'Our Lady of Ipswich' was not among the statues consumed by the fire. On the west coast of Italy, half-way between Rome and Naples, adjoining the town of Anzio, where some eleven thousand English and Allied soldiers lost their lives between 1943 and 1944, stands the little seaside town of Nettuno. In its main church, a majestic basilica, there stands in a place of honour a statue of 'Our Lady of Grace'. It was transported there, as the townspeople firmly maintain, in 1550 by sailors from the town of Ipswich in England, who had rescued it from a fire. Locally it is known as 'The English Lady'. This is not folklore, for the traditions go back hundreds of years and were recorded in writing. From these we know, for example, that there was no shrine to the Mother of God in Nettuno in the early sixteenth century. And a document of 1718, itself based on earlier records, quite clearly states the origin of the statue as the otherwise unknown town of Ipswich. According to this, the ship, headed for Naples, arrived in Nettuno in 1550, when following a terrible storm, it found refuge there. The sailors gave the statue to the town in thanksgiving and here the image was kept in a seashore church by the altar dedicated to the Annunciation. This manuscript description is confirmed by oral tradition. This insists on the origin of the statue as 'Ipswich in England' and also on the name of the statue 'Nostra Signora delle Grazie', 'Our Lady of Grace' (a title apparently unique in the history of English devotion to the Mother of God). Moreover, there are other documents and a scientific analysis of a sliver of wood from the base of the statue has been found to have a high salt content - proving that it had at some point been in contact with seawater or sea spray. Moreover, the style of the statue (made of oak, as was common in England), even after Catholicising 'restorations', suggests an English origin. The fact that the Christ Child is supported on the right knee of the Virgin was extremely rare in Western Europe outside England at the time. (Continental images show the Christ-Child on the left knee). Apart from the Catholicising re-paintings and 'restorations' (5) of the statue, apparently in 1594, 1650 and 1959, the statue is otherwise accepted by experts to be in full accord with English iconography of about the thirteenth century. This was confirmed when an apparently mediæval English inscription on the statue was found in 1959, reading 'Thou Art Gracious'. A specialist on the subject of mediæval statues of the Virgin, looking at photographs before recent restorations and consulting records, has suggested what the original 'Madonna' looked like before the Catholicising 'restorations'. For since 1550 restorations, among other things, have placed the Christ-Child in a reclining position and a throne has been added for the Mother of God and Her veil removed and faces re-carved, in accordance with Italian Roman Catholic taste. 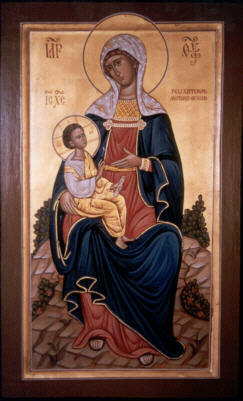 It is from these suggestions that in 1998 Fr Theodore Jurewicz, the distinguished Orthodox iconographer, was invited to paint a new Icon of the Mother of God, 'The Felixstowe Mother of God', modelled on the reconstruction of the original Image revered there. This Icon is not only a canonical Orthodox Icon but also it is faithful to the Orthodox traits of the very conservative English Orthodox iconography as it survived in the Ipswich Mother of God. We believe this Icon to be the faithful re-creation, in Orthodox manner, of 'Our Lady of Grace', the Holy Image venerated for centuries in the great Shrine of England at Ipswich in 'Holy Suffolk'. It is this Image that is today honoured by the Orthodox Christian people of Suffolk in St Felix and St Edmund Orthodox Church in Felixstowe. Thus Our Lady's mysterious blessing of England returns from a seaside town of Italy to a seaside town of England: history turns full circle and a historic wrong is redressed. May this part of Suffolk once more become a place of pilgrimage in honour of Our Lady, as Her Shrine is revived. Most Holy Mother of God: Save Us! (2) I am indebted for much of the following to Stanley Smith's The Madonna of Ipswich, Ipswich 1980. (3) The town of Evesham takes its name from the cowherd Eoves who had in 702 a great vision of the Mother of God in that place. The Monastery of Evesham, founded by St Egwin, Bishop of Worcester, grew up on the site of that vision. (4) This is very close to where now stands the Orthodox Convent of the Annunciation in Brondesbury Park. (5) Several Orthodox Icons of the Mother of God, most notably that of Czenstochowa in Poland, have been subjected to such Catholic 'restoration', i.e. overpainting. Underneath the layers of paint these Icons are fully Orthodox. Article published in English on: 23-3-2010.